Getting a lot of texts right now from folks who presume that I'm happy right now that Tennessee has fired Butch Jones. It's a natural presumption, I guess, and it stems from the story I wrote last December that included internal sources who were critical of Jones and skeptical of his viability in the position. Yeah, they were right, which seemed clear at the time -- but, no, I'm not happy. There's no joy in seeing where Tennessee football has sunk, and there's absolutely no joy in seeing Butch (or anyone) being fired. It was necessary. It was inevitable. But, no, this isn't by any means a joyous day. It's been beyond embarrassing to watch this fall, including Saturday. It's been a struggle for so many of my friends who work on campus. They're good people who deserve so much better. But this isn't cause for a parade. For one thing, it means that many others on staff will be let go. There will once again be turnover inside the football building and athletic department. You think of those people, those families, impacted by a firing. There will be other jobs for most, and they all know it's part of the territory, but it doesn't alleviate the hardship. Additionally, and something that was even acknowledged repeatedly within the story about him: Butch Jones did positive things for the University of Tennessee. He wanted to do right. I remember Butch telling me, the first time I met him on Signing Day 2012, that he "wanted to make me proud" of Tennessee again. He set out with all those intentions. I appreciated that. Behind every goofy mantra, every eyeroll-inducing gaffe, was someone who wanted to win and do it the right way. It got off track, clearly, but it was certainly well intended. He fell short because his ceiling was limited. That became more and more obvious over time, but it was glaringly clear when the 2016 team not only failed to win the division and reach Atlanta - but when it fell on its face at Vanderbilt with a Sugar Bowl bid on the line. If the staff couldn't get the Vols over that hump in that moment, it was simply never going to happen. That's when inevitability set in for me. But let's not lose sight of what a morbid situation Jones took over. Both lines were essentially devoid of talent and depth. Recruiting had been an afterthought, which is comical to even think about in the context of the SEC. The next coach will not have nearly as tall of a mountain to climb, and he'll have Jones to thank for the foundation. Granted, Jones had started to undo some of that progress -- his work with alums early on was terrific and needed, which is why the recent Antone Davis story was so alarming -- but the whole thing is still so much further along than it was following Derek Dooley's reign of terrible. 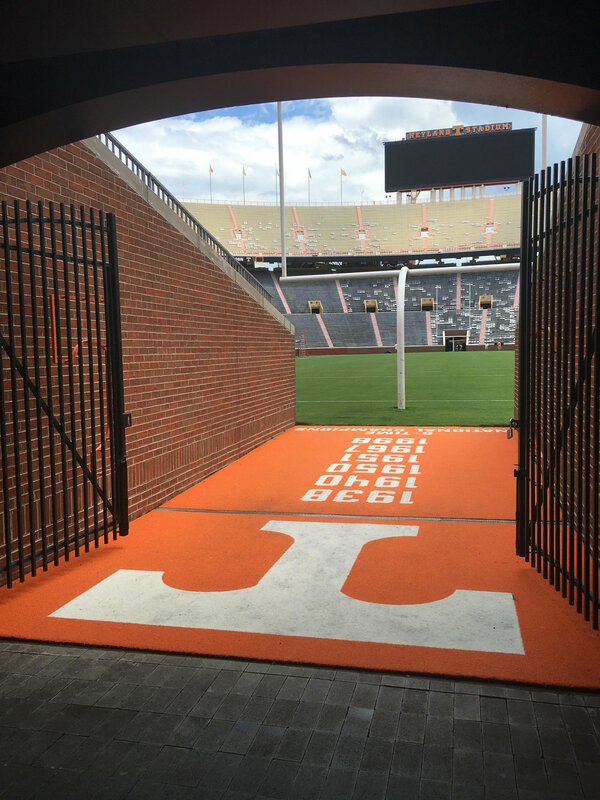 So, if you're a Vols fan, at least tip your cap to Jones for his teams that metaphorically moved the ball -- and pray that AD John Currie and other decision-makers find the coach who can move it across the goal line. My thoughts haven't changed much since I wrote this early October, but I continue to talk with alums and those close to the program -- and we almost all agree that Mississippi State's Dan Mullen adds up for both sides. -- Mullen is confident enough to handle a job that can make others melt down. (See: Jones.) It takes someone headstrong. My concern there is headbutting with Currie, but Currie's got to be wise enough to work that out. -- It isn't requisite, but vast experience in the SEC has to count for a lot. He knows the league. There would be no learning curve there. -- Relative to talent on roster, his teams overachieve just about every year. Including 2017. That has to be music to the ears of a program that's seen teams consistently underachieve relative to talent. -- Part of that is I've noticed Mullen seems to hire extremely well. He's had several changes over the years, and more often than not, he gets the hire right. Even when he missed with DC Peter Sirmon last year, the decision was rectified and improved. Hiring is a necessary trait for a coach in this CFB world. -- On his end, surely he's tired of sharing a division with Bama ... Auburn ... LSU ... et al. The ceiling is defined for even Mississippi State's overachieving teams, just because of the nature of the division. That isn't true of Tennessee and the SEC East. It should be regularly in Atlanta, and most people agree with me that Mullen is more than capable of that. He'd be my choice.